Fearing a hefty ransom demand by the Mongols to return the in 1449 captured Ming Zhengtong Emperor, the imperial court decided to re-title him to "Supreme Emperor" or "Retired Emperor". In his place, his younger brother Zhu Qiyu was enthroned with a reign title of Jingtai. Zhu Qiyu (born 1428) was 22 years old when he ascended the throne. He was a weak and indecisive person, but luckily for the empire able ministers stood by to handle court duties. 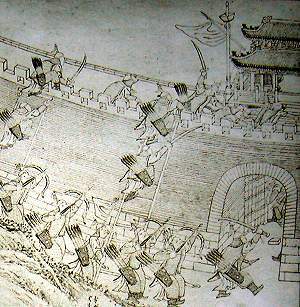 The catastrophic 1449 Tumu Incident where the Ming troops were slaughtered and the Ming emperor taken hostage led to widespread panic in Beijing. Anticipating that the Mongols would press their luck and assault the capital many officials called for the court to immediately abandon the city. But vice-minister of war, Yu Qian, saw it differently. 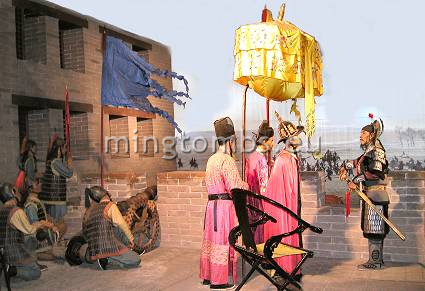 He mustered all able bodied men in and around Beijing and took charge of the defense. Well equipped troops were positioned outside the nine gates of the capital and when the Mongols indeed attacked in 1450 they suffered a heavy defeat after a battle lasting 5 days. The Mongols were driven back up north -behind the Great Wall. The defeat of the Tumu Incident was blamed on the hereditary military elite. And the consequent rise of Yu Qian became the turning point in recent Chinese history where the civil bureaucracy replaced the military leadership in terms of imperial power. The Mongols treated the captured - now officially "retired" Supreme Emperor - well and the latter even befriended Esen Khan, the Mongol leader. The Mongols realized that the captured emperor had little value as ransom and when they furthermore suffered a defeat when attacking Beijing the following year, Esen Khan decided to release the emperor. The new emperor, Zhu Qiyu, sinisterly decided to send only a sedan chair and two horses to meet the released emperor - a major loss of face for the dethroned Zhengtong Emperor. He would never forget or forgive this massive embarrassment and it played an essential driver for his coup seven years later. Zhu Qiyu seized his brother, the former emperor, when he made it back to the imperial capital. He was installed in the southern palace of The Forbidden City and held captive there along with his wife, Empress Qian, who opted to go into house arrest with her husband. They were kept totally incommunicado from the rest of the palace, basically living their lives as virtual prisoners. It took almost seven years and a good opportunity for the former emperor to take back the reign in a coup d'etat. Zhu Qiyu appointed his only son as Heir Apparent but to his dismay his son died very young. And when Zhu Qiyu fell seriously ill in February 1457, his older brother rammed open the gate of the Southern Palace and with the aid of his collaborators dethroned Zhu Qiyu in what is now known as the "Storming of The Gate" incident. The dethroned Jingtai Emperor was demoted to the title of prince and died shortly after. Rumors have it that he was strangled to death - possibly with a little "help" from his older brother. A very simple tomb layout for a Ming emperor owed to the fact that Jingtai was actually buried with only rank of prince. In front is a divine memorial stele inside a double-eaved structure. The front gate is a standard 3 by 2-room structure. 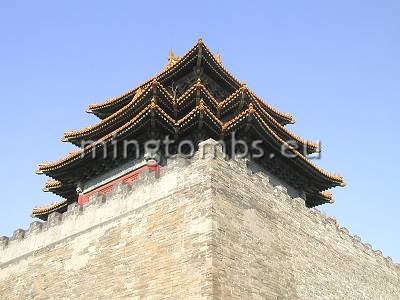 The roof tiles are of the gray type and not the imperial yellow-glazed ones. 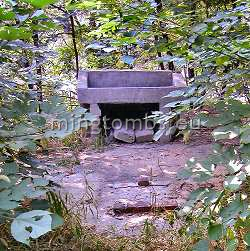 The tomb is built up an inclining hillside at five distinct levels. Two croquet fields occupy the lowest level. Level two does not appear to have any function. The third level is quite large and probably once housed some sort of sacrificial building. Level 4 contains the ruins of an old structure, which is probably where the seven concubines were buried. Jingtai's tomb was underneath the rear and highest level 5, encased within the curvature of the back wall. 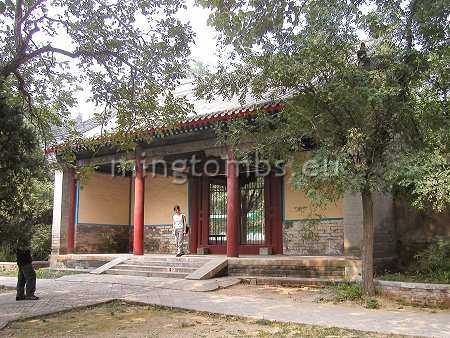 The tomb is located in Beijing's suburbs around the Western Hills area -about 2 kilometers NW of the Summer Palace. 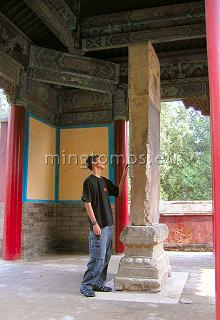 Jingtailing - the Fifth Tomb, Right? Actually it is not. I concede that if the Jingtai Emperor had passed away in 1457 as Ming emperor he would have occupied the fifth tomb in the imperial burial grounds around Mt. Tianshou. Fact is, however, that as mentioned above, his elder brother, Zhu Qizhen, now in power as the Tianshun Emperor, had demoted his younger brother, Zhu Qiyu and former Jingtai Emperor, to an imperial prince after having re-ascended the throne. And as if that wasn't degradation enough, Zhi Qizhen took a real sweet revenge over the "sedan chair and two horses" (see above) incident and the seven years of confinement by having the former Jingtai Emperor's almost finished mausoleum at Mt. Tianshou completely demolished. Not a single brick or stone was left above ground. Zhu Qiyu was instead interred with his empress Wang in Jinshan Hill of Xishan Mountains in Beijing's Western suburbs with the honors proper for a prince only. His tomb is called Jingtailing (meaning "Jingtai's tomb"). Later on the Chenghua Emperor (r. 1465-87) reinstated Zhu Qiyu's imperial status, but he was never reburied and still rests in Beijing's Western Hills. In a strange twist of fate it was only the surface parts of Zhu Qiyu's intended imperial tomb that were demolished. The Underground Palace grave was merely abandoned and was "recycled" in 1620 when a tomb was needed quickly for the 14th Ming Taichang Emperor, who died suddenly and unexpectedly after reigning for only 29 days. Princes' tombs are smaller than those of emperors and Jingtailing is no exception. It is even rather difficult to find. Built up against a small hillside, it is nowadays located inside a military personnel retirement compound, well tucked away amongst the trees and bushes. First up the hillside you encounter the memorial shrine, a square construction with doors on all four sides. It has a double eaved roof covered with yellow glazed tiles. A more recently erected wall encases the building. Inside and in the center of the shrine on an elevated platform stands the divine merit stele. In emperors' mausoleums the stele would typically be mounted on the back of a tortoise to signify longevity. Not so for princes; at Jingtailing the stele just rests on the elevated platform. The stele carries a Chinese inscription on its southern side. The Jingtai Emperor's name is inscribed on the northern side and - note well - it is referred to as "emperor" and not "prince". 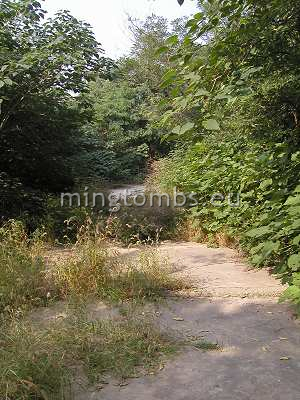 Some 50 meters further north lies the front gate to the tomb area. 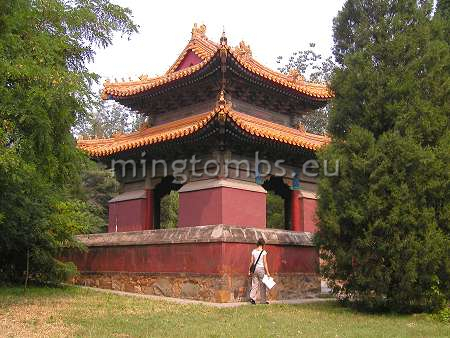 The size is similar to the modest standard of Ming mausoleum gates: 3 rooms wide and 2 rooms deep. The gate is covered by a simple, single eaved roof without hip and gable. The roof tiles are not the imperial yellow glazed type, but just the standard gray. As is obvious also with the divine merit stele house, restoration must have taken place sometime in the 1990s. Narrow footpaths run along the inside of the wall on both sides of the tomb. 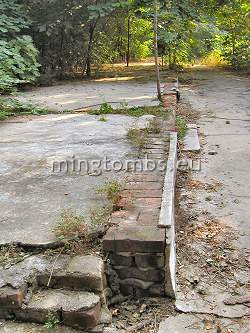 The wall surrounding the mausoleum is to a large extent still standing, but most of it is quite dilapidated. In a few places one can still trace remnants of the tiled roof covering the wall. The eastern and western side walls incline in step with the rising landscape of the tomb mound. The mausoleum has 5 distinct levels. Inside the front gate at level 1 the military pensioners have built croquet fields for quiet entertainment in their sunset years. Level 2 has no apparent contents or other purpose than following the natural landscape. Level 3 is quite large. Nowadays it gives space to two sport fields, but this is most likely where some sort of sacrificial hall once stood. Only the base remains of a structure that covered a large part of level 4. It is possible that some or all of the seven imperial concubines were buried here. In the center of the back wall of this level there are some brick foundations indicating a former structure rising up in front of the rear and last level -level 5. Zhu Qiyu's tomb is underneath the center of level 5 in the rear of the mausoleum. This level is encased inside the curved part of the back wall. On my photo, the tomb is located underneath the middle "slab" -the one that the sun is shining on. The only evidence left of a tomb are some very small structural ruins of unknown purpose and an unnamed marker in the ground. The photo on this page shows the top part only -looking south. The structure is resting on a brick platform which sits on level 4 below. 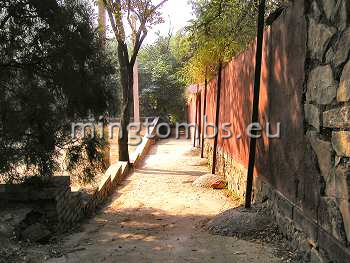 The small markers in front of the mysterious structure on the photo allegedly shows the location of Zhu Qiyu's tomb.